Ever cooked with curry? We hadn’t – until now. Why not? We thought it would be too spicy and smell too strong. Truth be told, we were half right. While the curry smell is not our favorite thing in the world, the results of our first foray into cooking with curry tasted pretty good! In a large pan (we used All Clad) that heats evenly, drizzle a little olive oil and heat on medium-high. Add ½ diced yellow onion, and cook until it’s slightly browned. Add 1 large clove minced garlic, ½ teaspoon curry powder, ¼ teaspoon cinnamon and stir. Add 1 can of drained, rinsed chickpeas, 1 tablespoon ketchup, ½ teaspoon salt, a dash of pepper, 1 cup water. Bring to a boil, reduce to simmer, cover and cook 15-20 minutes. Uncover, turn up heat to medium-high, cook another 5 minutes until sauce is reduced. Serve with some minced scallions, chives or cilantro. Sprinkle with lemon juice. As a side, this serves 3 people; as a main dish, it serves 2. It seems many people are confused about beans – how to cook them, whether to buy dry or canned, what types of recipes to use. And others are not even sure they like beans in the first place. The good news is that beans are a nutritional powerhouse, and can be so versatile in the kitchen. This recipe is a perfect example of the simplicity of beans. 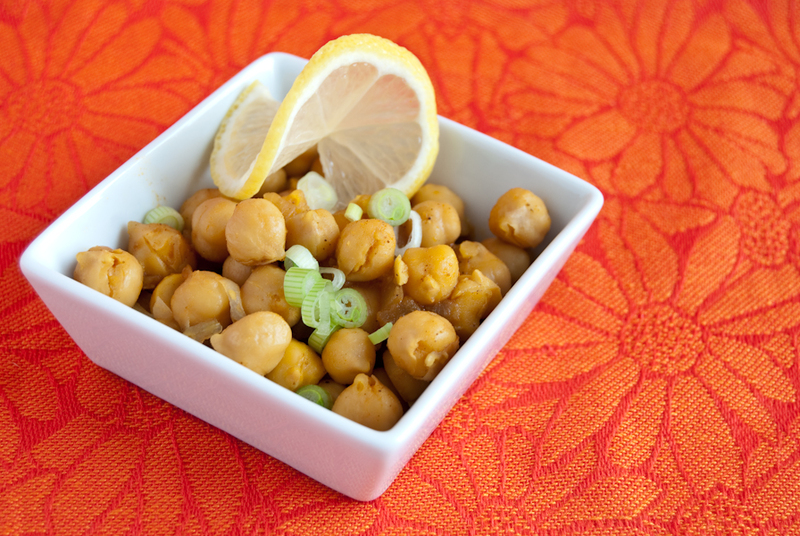 Chickpeas, or garbanzo beans, are probably best known for their starring role in hummus, but can be topped on salads, tossed with pasta, or added to soup. They are high in fiber, protein, and a good source of iron and folate. Curry powder contains turmeric, which has been linked to such health benefits as preventing indigestion, lowering cholesterol and reducing inflammation. Many of the studies have used animal models, and there is not, as of yet, enough information to make solid conclusions. As with most other foods, including herbs and spices, moderation is good practice. And if you can handle some spice, enjoy! How Stacey Got the Shot: These linens have been waiting for the right dish in which to make their photo debut. Natural light bounced with foam core. ISO 100, focal length 48mm, f/6.3, 1/13 second exposure.